Physicians Formula as a brand creates cosmetics and skin care for people with sensitive skin. As we all know that these are quality products that are not as bad for our skin, all kinds of people with all skin types buy these products. Physicians Formula pride themselves on providing products that are high-quality and hypo-allergenic. In fact, they are so gentle on the skin that they are recommended by allergists, dermatologists and plastic surgeons. The origin of this company is actually a love story and I am a sucker for love stories. “Dr. Frank Crandall created a unique line of cosmetics for his wife”. She was a woman who wanted to feel beautiful and he did what we all want our men to do, make us feel beautiful. Now this product that I am reviewing is the only one of two products I have tried from this brand. And to be honest, it is my favourite blush. 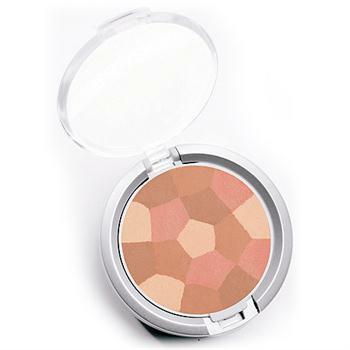 The reason that I love this blush is that it is multi coloured. “Made from the finest Italian talc, it provides a silky-smooth application that blends easily.” It blends and adapts to any skin tone to make your skin look more beautiful. It really works and you will have this beautiful natural blend without looking too pink or overdone. The second thing I like about this product is the Brush. The brush is like a thick contour brush helping you to blush in precision as people apply it to different points of the face. For people with more prominent cheek bones, it may just go on the apples of the cheek, for people with a flatter face, it may by higher actually on the cheek bone itself and closer to the ear. After getting product on to the brush, it will never leave you with excess. You use what you get on the brush. And lastly, it is so compact and small. But even though it is small, it will last you a long time. There is so much product in it you won’t find yourself running out any time soon. The compact size allows it to fit in the smallest of purses. It is too cute. There are some negatives. First of all, now that I am suffering with acne which does make the skin a lot more dry, it would be nice to have a little shimmer in the blush but not too much. The last thing you need to worry about is dropping it. Once it hits the floor, you will have a lot of product everywhere. Enjoy cleaning it up. It is just an excuse to go shopping and buy another one as well as a lot of other goodies. To Buy? : Hell YEAH!! A Total Must Have.